I was the first journalist to be let under the tent of the show that Sharon Browne and Phil Coulter created four years ago. I can still see the years in Phil’s ruggedly handsome and weathered face fall away as he described the concept of the show with boyish enthusiasm. He wasn’t boasting over pints at the pub that night -- that first Celtic Thunder show delivered an overabundance of theatrical delights from new names and faces. The second album hummed along as well, and then one got the sense that some of the subsequent albums were milking a concept growing long in the tooth. That had me complain bitterly in these pages about how one of my favorite shows had jumped the shark, resulting in a dramatic strike of the pen off the creators’ holiday card list. By the time the unbearable corn syrup-pop of That’s Entertainment came out last year and Coulter peddled schmaltz like Chicago’s “Hard to Say I’m Sorry” and a pitiful “Surfer’s Melody,” I had taken to wearing black as I mourned the death of a nifty entertainment concept. That was that, I thought. Then along came this year’s Heritage, a rousing return to form. The collection included trad standbys like the Clancy Brothers’ “The Dutchman” and “Whiskey in the Jar,” and it seemed to drag the franchise out of Sammy Davis Junior lounge-lizard territory and back into the Irish roots of the original. Don’t get me started on this summer’s brilliant performance of young cast member Damian McGinty on the wildly successful Glee Project. It put me back in the show’s corner once again! 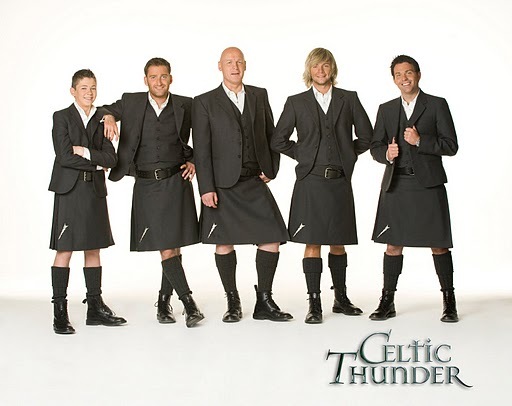 McGinty has reportedly left Celtic Thunder for some Hollywood lightning right as Storm, the second 2011 show and album of Celtic Thunder, is released. The theme of Storm involves land struggle and cultural differences through the vibrant dynamic of musical theater. The show bursts forth onto a nighttime, flame-lit scene with an energetic, highly primal dance number to an underlying Celtic beat, "Storm Overture." Storm is a turbulent, raucous stand-off between the darkness of gypsies and the resolution of the settlers both fighting for the same piece of land. The gypsies have inhabited the land for generations and the settlers are looking to put down roots and build their community. We’ll just focus on the music crafted and constructed by legendary Coulter for now. He has employed Irish soprano Deirdre Shannon to play a noble woman in Storm that inserts Clannad favorite "Harry's Game" into the repertoire. Coulter wisely avoids messing with this Picasso of a song, playing it straight to ensure the haunting quality of the original stays intact. One of the more appealing things about this show concept is the choices Coulter makes as he shines the spotlight. New voices are discovered and a new audience is brought to deserving artists like Paul Brady and Christy Moore. This kind of big theatrical production may or may not be your cup of tea, but Celtic Thunder as a vehicle to drive demand of Irish songwriters is something we can all agree on! The King of the Gypsies character, played by the rakish Ryan Kelly, woos away the daughter of a settler in the number "Midnight Well," a dramatic flamenco-infused tango that amplifies the darkness of Kelly’s character. Older “brother” Harkin tempers these boasts in an attempt to take the kid down a peg. “You know nothing at all about ladies/let me give you a piece of advice/you think you’re a bit of a killer/that ladies will fall at your feet/Ha!/they can eat you for supper/and spit you right on the street!,” he warns. It’s a classic Coulter arrangement, a playful march punctuated by sassy Irish melodies from the fiddles and strings. Revamped arrangements on Celtic classics such as "Lagan Love" and "Mo Ghile Mear" (Hail the Hero), another Coulter signature move, are included in the Storm soundtrack. The end result is that Sharon Browne and Coulter's new production will no doubt wow PBS audiences with a winning soundtrack. Coulter is an arranger and producer without peer, and Storm is evidence of that. The Dire Straits classic rock riff and solo on “Midnight Well,” layered atop a tango piano melody, juxtaposes styles to a fiery effect. The spooky piano tinkling of Coulter’s “Coultergeist” (from his brilliant Highland Cathedral album) is dusted off to add some creepiness to the breathy, ethereal “Shadow’s Dancing.” The chanting chorus and big drums of the trad ditty “Mo Ghile Mear” is a fitting end to a winning collection. An interview with Coulter and a review of his new orchestral album, Heartland, is coming next week. Keep it tuned here! To find out where Celtic Thunder will unleash a storm in your neighborhood, log onto www.CelticThunder.ie.